A flier for Faculty & Staff Appreciation Night, this Thursday, Jan. 28. The Brenau Golden Tigers basketball squad squares off against the College of Coastal Georgia Thursday, Jan. 28, at 5:30 p.m. 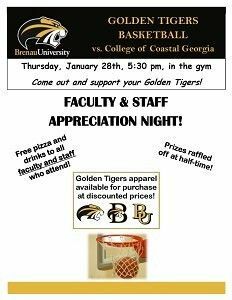 The event also marks Faculty & Staff Appreciation Night, with free pizza and drinks available for Brenau employees while supplies last. The all new Golden Tigers Pep Band will make their grand debut at the game, with Golden Tigers apparel on sale at discounted prices. Prizes will also be raffled off at halftime. Come enjoy a great evening of varsity play at the Brenau University Basketball Court. Bring the family and be sure to sport your finest black and gold attire!